Pho la la la la. The restaurant was a twenty minute walk from his house, and walking was our favorite way to get there. Outside, our laughter warmed us, even as our breath froze along the top edge of our scarves. We strode down the hill, the cold air burning our lungs. It felt invigorating, not punishing as it sometimes does, but still, it was a relief to step inside. And inside, it is the steam I remember. Steam, rising off the bowls that were recently boiling, filled the air, condensing on the cold window. Our coats hung on the rack behind him, and we were tucked in, surrounded by warmth. He leaned over the bowl, breathing in cardamom, cinnamon, star anise and ginger, and the steam clouded his glasses, making his eyes disappear. Now the sound of our laughter filled the small restaurant, entwined with steam and the sense of the glorious unknown. Over a bowl of soup, I was falling in love. I had not known this particular type of soup before I met this particular man, this one who would become my fiancee before the northern world warmed again. The soup was Pho, comfort food from the faraway land of Vietnam. The base is simple: clear broth, beef or chicken, with onion and spices. Heated to boiling, the broth is combined with long white rice noodles and some kind of meat, and rushed from the kitchen to your table. Sometimes the meat is still pink when the soup arrives, but this is part of the fun. Just take a chopstick, push it into the broth and watch it brown. 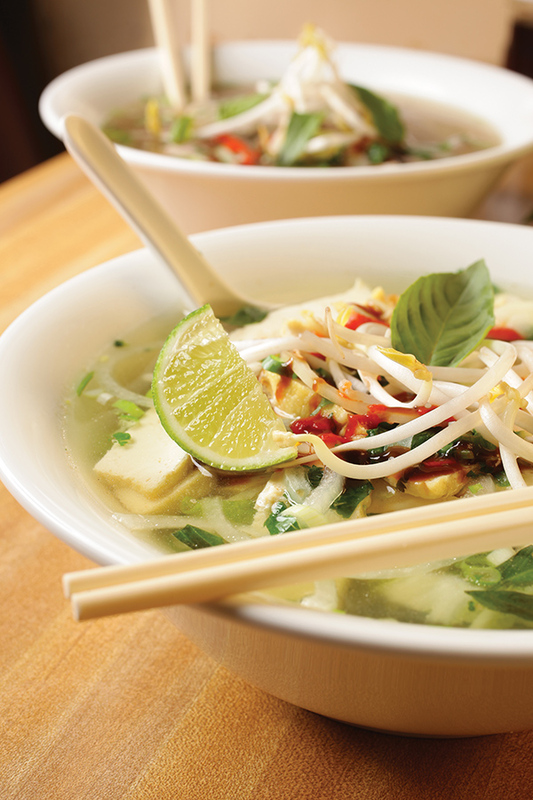 With a bowl of Pho comes a plate of toppings: crunchy bean sprouts, leafy thai basil and limes, all piled high. What luxury in mid-January! And the final step makes each bowl your own creation. Sauce. Will it be sweet brown hoison, spicy sriracha, fish, or salty soy? Or if you’re really brave (or have a really bad cold), how about a dollop of that mysterious red paste? Just go slow with the red paste. Trust me on this one. We’ve been married for ten years, this man with the clouded glasses and I. This fascinated me. How did these foreign flavors become my daughter’s comfort food? I didn’t know that Pho existed until I was almost thirty, and here she was, not even five, speaking Vietnamese. Of course we said yes, and soon we were bundled into the car for the short drive to our favorite restaurant. 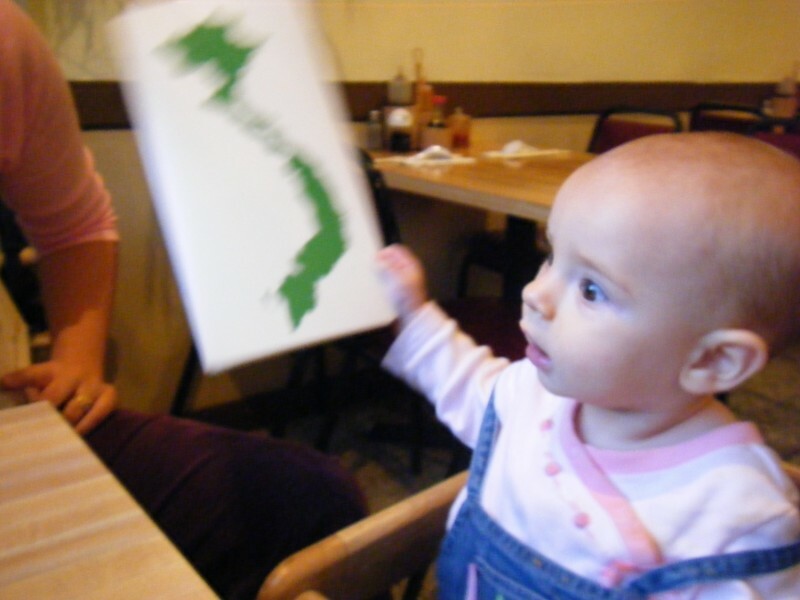 “Now,” she turned to us, “Extra basil in the spring rolls? You want two or three bowls today?” She rattled off our normal order, we nodded, and she returned to the kitchen. Settling into our chairs, we rested for the first time that long day. Of course we came here. Pho is our family’s ‘chicken noodle soup’, and though Vietnamese food may not be a part of our genetic code, it will always be a part of our story. The second is of the aforementioned daughter, making her selection from the menu, three years pre-stitches. This entry was posted in Food & Place and tagged chicken noodle soup, comfort food, dating, love, pho, pho minh pittsburgh, pittsburgh, Vietnamese food. Bookmark the permalink. Jennifer, this is storytelling at its best. The imagery is incredible. I can see the steam, smell the soup, AND the opening of the story took me back to the “glorious sense of the unknown” that I experienced when I was falling in love with my boyfriend/now husband. Thank you. If only you could taste the soup! LOVE. I have good memories of that restaurant and with you guys. I was there at the restaurant when that pic was taken. And then the time when our good friend Hongla taught us to make Pho at home. It’s still a treat to go to that restaurant…I should think about going there very soon! Pho. The soup to end all soups. I like that, Tricia, “the soup to end all soups.” 🙂 We’ll need to go together this winter!